This issue of The Psychologist has five articles on social identity and health. These provide an overview of the social identity approach advanced within The New Psychology of Health. This can be thought of as a practical handbook for researchers and applied psychologists who are looking for a clear account of the way in which social psychology can be made relevant to health and wellbeing. The particular brand of social psychology that the book promotes is concerned with the importance of social groups for our health. Research in this fascinating field goes back to classic studies that demonstrated how perceptions and behaviour are structured by our group memberships – even when those groups have no prior meaning (Tajfel et al., 1971). In recent times, studies on very young infants have found strong ingroup preferences, again based on very small distinctions, such as which sorts of crisps the infants prefer (see e.g. (Pun et al, 2017). So, the importance of our connection to others is undeniable. We are clearly social creatures. For some, though, a frustration has been how to apply this work in clinical practice and in health settings more generally. An opening case for the capacity of The New Psychology of Health to deal with this theory–practice gap was made in The Social Cure published six years ago (Jetten et al., 2012). This set out the research evidence for the effect of membership in social groups on health, and explored the various ways in which this knowledge could be mobilised in practice. That book was divided into five sections each addressing a particular theme: health and wellbeing; stigma and coping; stress and trauma; recovery and rehabilitation; and theory, practice and policy. The New Psychology of Health progresses each of these themes in substantive and persuasive ways. The opening chapter in this comprehensive text makes the case for the importance of the social groups to which we belong for health and the equal importance of our identification with these groups. 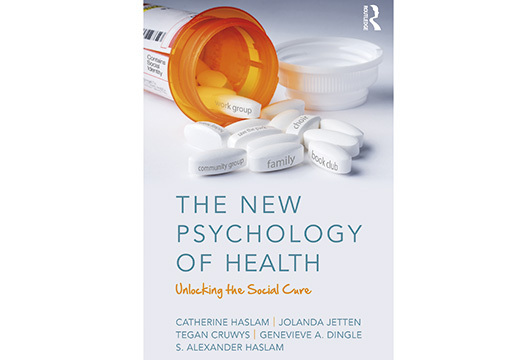 It discusses the different contemporary approaches to understanding health (biomedical, psychological and social) and provides a well-argued case that the social identity approach has something important to offer that is highly relevant to both impact and delivery. After this introductory chapter, the book is essentially divided into two parts. The first part covers the arguments for this approach in dealing with many of the same themes as in The Social Cure, but in a more accessible manner, with examples that bring each theme to life. The second part covers areas of clinical practice (trauma, ageing, depression, addiction, eating behaviour, acquired head injury, pain and chronic mental and physical health conditions) and explores how the social identity approach can be utilised in these different areas – again using helpful examples and case studies. The final chapter describes the Groups4Health programme and its effectiveness. All the chapters have a similar format, with the main body of the text covering the core theme and concluding with key points for practice and resources. As the authors point out, applying this knowledge is not so easy. In the same way that simply telling someone to stop smoking won’t necessarily help them to do so, telling people to join a group (lots of groups if possible) is also unlikely to work. Nevertheless, I am old enough to remember how long it took to convince people that smoking was harmful and to deal with the vested interests concerned. We may be in a similar situation concerning social approaches to health and wellbeing, as the recognition of its importance, both in keeping us well or making us unwell is a first step to doing something about it. Again, though, there are strong vested interests that disrupt this important message (see e.g. Gøtzsche, 2013). For researchers and those in the healthcare business, the book’s appendices are a further source of useful material. The first appendix is a set of hypotheses derived from the social identity approach to health. As the book shows, these have been subjected to, and supported by, a variety of tests in both experimental and field settings. These are invaluable as they allow a very specific focus on, for example, the type of group with which you identify and the potential outcome for your health and wellbeing. The other resource is a series of assessment tools that can be used to characterise groups and group identification. In summary, this book is a potential game-changer in how we conceptualise our interventions, and I thoroughly recommend it. It is a relatively easy read and provides clear guidance on the application of well-researched theory. It packs an important, fresh and timely message and should be an invaluable resource for psychologists in training, those who provide training, and for researchers, policy makers and a lay readership who simply want a better understanding of important issues at the heart of health. Gøtzsche, P. (2013). Deadly medicines and organised crime: How Big Pharma has corrupted healthcare. London/New York: Radcliffe. Jetten, J., Haslam, C. & Haslam, S.A. (2012). The social cure: Identity, health and well-being. Hove/New York: Psychology Press. Tajfel, H., Billig, M.G., Bundy, R.P. & Flament, C. (1971). Social categorization and intergroup behaviour. European Journal of Social Psychology, 1(2), 149–178.